I pictured my main protagonist as a long, black-haired mysterious hero with cloak sweeping around him as he jumps into battle (have I been watching too much batman?). As I toyed with this and how to write about him without making things cliché, I began to think of a second character who was a sort of opposite. Whilst the battle would turn on the good guys, a tough, gritty veteran would be part of the fight. This one would be one of those characters who storms around shouting for soldiers to get to their feet, the ones like Sargent Horvath in Saving Private Ryan, someone who shows the scars and experience and scars of battle. My character was based on a book/TV series that I used to really enjoy; Sharpe. 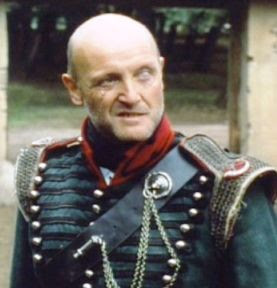 Much as I found the characters of Sharpe and Harper interesting to read about, it would be my favourite character that I would picture whilst I wrote. William Fredrickson was a fantastic character (and quite a tragic one if you read the books) who bore the scars from a cannon explosion. With false teeth he gathered from the dead (and took out before battle), a missing eye and a wig to hide his burnt scalp, he was a fantastic sergeant to see and visualise. Roaring at the men to hold, he was funny and ferocious at the same time. Much as I didn’t make Helmvich witty, I would take some of those elements. I’m probably going to change his (or Heinrich’s) name eventually as a beta reader suggested their names were too similar. In a book where there are many characters, you can’t make it too confusing I guess.